All the discs of that color. 1 scientist pawn of that color. Put the other 3 scientists in the recruitment pool 1. Choose the starting player randomly; give him the Start Player tile 2. Each player places 1 color disc on the "0" number of the scoring track 3. Player color discs will be also used to mark ownership of green power plants 4 and Expertise 5 in each energy source. Place the Decade counter on the Decade track 6 and the Round counter on the Round track 7 on the space indicating the number of players for the game (assign each of the above tasks to the player sitting next to it. He will be responsible for managing it during the game). Place the white tech resource cubes on the board 8. Make a bank outside the board, and choose a player to manage it 9. Money is open to all during the game. If you ever want to know how much money another player has, you just have to ask. Separate the projects by type (energy source symbol) and place them near the board 10. Separate the Green Power Plants by type, then organize each type by tech resource cost, (tiles with a lower re- source numbers go on top), and place them near the board 4. Shuffle all 2-topic Summit tiles. Place them randomly, face-up, in their proper places on the board 11. Shuffle all the remaining Summit tiles (mix the 2-, 3-, and 4-topic ones together), and make a face- down pile 12. Distribute the Regional Agenda tiles randomly in their proper places on the board, face-up, one to each region 13. Remove the remaining tiles from the game. Make a random face-down pile with all the fossil fuel power plant tiles 14. For each region, take the top tile, and place it face-up on the leftmost space of the region's energy demand spaces 15. Add up the CO2 pollution level of all fossil fuel power plants on the planet (all regions), using the following CO2 value for each one: Coal = 40 ppm, Oil = 30 ppm, Gas = 20 ppm. Place the Global CO2 Pollution Level marker (black cylinder) on the corresponding number of the Global CO2 Pollution track 16. In each region, place a number of CEPs equal to the empty energy demand spaces 17: 2 in Africa, 5 in Asia, etc ..).. Make an outside bank with the leftovers. Place a pile of 2 CEPs in the middle of the market, and place the red CEP Market Price marker on the 3 space of the market price scale. This will be the initial price of the CEPs 18. 1- player game: Remove numbers 27, 30, 32, and 33. 2- player game: Remove numbers 28, 30, and 33. 3- player game: Remove number 30. Secretly, give one Company Goal card 19 to each player. The spare ones are removed from the game. Make a face-up display near the board with 10 cards (7 in the 2-player game) 20. Remove the others from the game. Shuffle all the Event cards, and create a face-down deck beside the board, near the Event space 21. Reveal 1 Event card face-up on the Event space, then reveal the top card of the deck, such that 2 Event cards are visible. Shuffle all the Lobby cards and give 5 to each player 22. Experienced players are advised to use a card drafting system. In that case, choose 1 of the 5 cards and pass the other 4 to the player on your right. Then from the 4 received, take one and pass 3 to the left. Continue doing this until there aren't any cards left to pass and each player has 5 cards in his hand. You are ready to start playing! Note: in the first decade, skip this phase, as it was replaced by the setup. Income is paid only to players in the 1st and 2nd positions in each energy source on the Expertise track. In a 2-player game, only 1st place in each energy source receives income. Players may choose to receive their Income as money and/or victory points. The amount of money/victory points earned as 'income' is depicted beside the player's disc for each Expertise track. In case of a tie for 1st or 2nd place, all tied players receive the full income. Example: Orange is the leading expert on biomass energy sources and he is second in recycling. At the side of those two orange discs on their respective Expertise tracks, he sees "4" and "2". So, Orange receives 6 income for the turn. He decides to take the 6 income as 3 coins and 3 victory points. Example: In solar Expertise, Purple and Blue are tied for first place. Orange, Yellow, and Black are tied for second place. Income is paid to all players. Each decade, any region with any tech resources consumes one; return the resource cube to the general supply. Fossil Fuel Power Plants are the pollutive energy sources in the game. They are necessary to fulfill energy demand not covered by green power plants. Each type of Fossil Fuel Power Plant produces a different level of CO2 pollution in the game. Each time these Fossil Fuel Power Plants come into play during this step of the Supply phase, the global CO2 pollution level increases and a CEP must be paid to the bank. Players have to determine which Regions need energy: Beginning in any region, and going clockwise around the world, players must see if the energy demand space that matches the current Decade number is empty or is occupied by a green power plant. If it has a green power plant, or all spaces in a region are totally filled, move on to the next region. Take the top fossil fuel power plant from the pile and fill that energy space with it; in the example above, a Natural Gas power plant is filling on the second space of South America to meet demand for the 2nd decade. 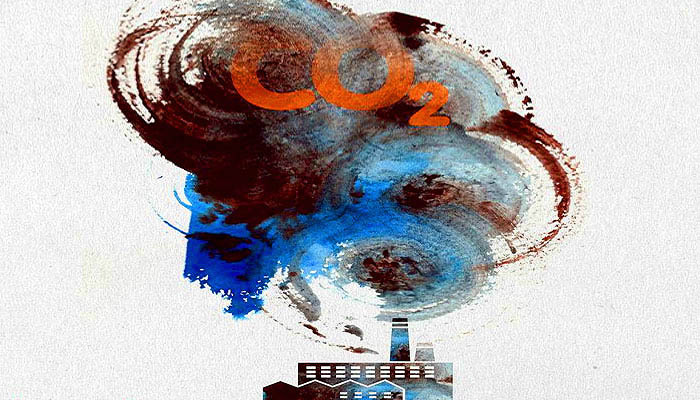 Increase the global CO2 pollution level according to the CO2 output of the fossil fuel power plant. (Coal = 40 ppm, Oil = 30 ppm, Gas = 20 ppm). The player who Controls the Region must pay 1 CEP to the bank from his hand, or from a region he controls (It doesn't have to be this region! ); if no one Controls the Region, the CEP is taken from the region's pile. If you don't have a CEP in your hand or in any of your controlled regions, you must buy one from the market. If you have insufficient money to buy a CEP from the market during the Supply phase (and only during this phase), you must exchange VPs for 1 coin each, until (and only until) you have enough to pay; move your disc one step back on the VP track for each coin taken. Negative points are allowed. If the global CO2 pollution level is 350 ppm or higher, a disaster occurs in the region specified by the event card on the event space of the event display. In order to provide relief and help rebuild the region, any player that is not supplying power to the region (i.e. he doesn't have at least one green power plant built there) must contribute one tech resource to the region. If player doesn't have enough resources to help the region, he immediately loses 2 victory points for the callous neglect of a region struck by an environmental crisis (negative points are allowed). After the event is resolved, discard that location card and move the face-up card from the deck to the Event space. Flip the top card of the Event deck face-up on top of the deck. The tech resources contributed to the region stay in the region. The regional government will ration these technological resources as grants for projects that will build new green power plants in the region. Each time someone builds a green power plant in the region, the regional government will provide one tech resource (if it still has any) to the project for free. That means that if you need two tech resources to build a power plant, the government pays one, and you pay the other. Count the rounds by moving the pawn on the Round track one step up, until it reaches the last space. Each round starts with the player in possession of the 'Start Player tile', and proceeds in clockwise order, with each player taking a turn. On your turn you must take 1 Action, and you have the option of also performing one or more Free Moves. Finally, you will choose one of your scientists on a project to increase your expertise. Advance the Decade marker one space. Return the Round marker to the space depicting the number of players in the game. Pass the 'Start Player tile' to the left (or use the Auction Variant). Example: The decade marker has been advanced from first to second decade. Projects are needed in order to build green power plants that rely on renewable resources. There are 5 sources of green energy in the game: forestation, solar, cold fusion, biomass, recycling. 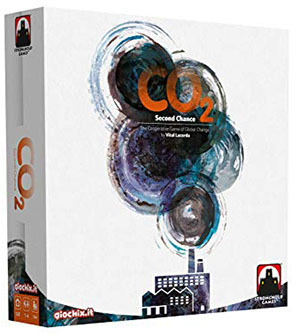 Forestation is truly an important element in the control and reduction of global CO₂ emissions, and thus was an imperative element to include in this game. In an effort to keep the gameplay and rules terminology streamlined, forestation is being treated as a green energy source. A project needs to be proposed, then installed before a power plant can be built with the construction action. You have your company design a green energy project for a region. In exchange, your company receives a grant from the region. The region takes ownership of the project; it does not belong to any one player. Choose a project of any energy source (solar in the example on the right), take the corresponding tile from the pool, and place it dark- side-up on any empty project space in any region that requires that source of energy. 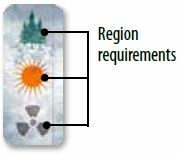 A region's energy requirements are shown on its Regional Agenda tile. Money: Take money from the bank equal to the number of Carbon Emissions Permits (CEPs) in the region at that particular moment. If there are no CEPs in the region, you still get 1 coin. Technological Resource cubes: Take two from the general supply. Research collaboration: Choose one: a) Move one of your scientists or b) take one of your scientists from the recruitment pool to your hand. Once recruited, the scientist is available to you for the rest of the game. Your company installs the energy network and infrastructure to distribute the power that will be generated by the coming Power Plant, in exchange for some benefits. In order to do that, you need to choose any proposed project, pay 1 CEP to the bank, and then flip the project tile. You receive the installation benefits shown on the flipped tile (see the solar example to the right). Installing a project has no monetary costs to your Company, but the process creates pollution, leaving an ecological footprint. As a result, you have to pay 1 CEP to the bank. This CEP fee must be paid before you receive the installation benefits, and can be paid from your hand or from any Region you control. If you have your own scientist on the project, you may leave it there after installation. If an opponent's scientist is on the project, you must pay him to leave. This action allows the realization of any installed project as a new Green Power Plant (matching the project, of course). When built, these power plants score Victory Points and give Expertise to the player who built it. Different power plants (forestation, solar, cold fusion, biomass, recycling) have different costs, and need different amounts of technological resources and levels of Expertise in order to be built. The region must have an installed project of the same energy source as the power plant. Your Company must have Expertise in that energy source, equal to or higher than the number of tech resources required to build it. Your Company must have the amount of money and the technology resources (shown on the tile) to pay the construction cost. Select the top power plant from any pile in the bank; find a region with a matching installed project (same energy source); pay the bank for the power plant. For example, you want to build a Solar power plant in order to realize an installed Solar project. The Solar power plant costs $10 and 2 technology resources. You must be in the 2nd space or beyond in Solar Expertise. Pay the $10 and tech resources to the bank. Place the power plant tile on the region's leftmost empty energy demand space on the board. Mark your ownership by placing a disc of your color on the new power plant. You score the amount of points shown in the top-left of the power plant tile. Advance your disc accordingly along the scoring track. You also earn 1 Expertise in the energy source of the power plant. See if you have taken Control of the Region's Energy supply (see 3 Region control). Send any scientist on the project away (see 2.2 Free Moves and 2.2.1 Scientists). Lastly, remove the used project tile from the board and return it to the pool (it will be available again). Replace the leftmost fossil fuel power plant with the new green power plant. Take 1 CEP from the Market and place it in the Region, respecting the Regional CEP Limit (see below). Remove the replaced power plant from the game, and reduce the global CO2 pollution level a number of steps equal to the pollution level of the replaced power plant. (Coal = 40 ppm, Oil = 30 ppm, Gas = 20 ppm). Regional CEP Limit: Regions cannot support more CEPs than the number of their Energy Demand Spaces. (Africa can have a maximum of 3 CEPs; Asia, 6; Europe and North America, 5; Oceania and South America are limited to 4). Note: Green Power Plants cannot be replaced. If a region only has green power plants, it is no longer possible to build power plants in that region. Any leftover installed projects in the region remain on the board. You can still propose and install projects that the region no longer needs. The regional government is corrupt enough to pay you anyway. Representing the research of Companies worldwide in green energy sources, scientists work on projects and summits, earning Expertise for their Company. Scientists can be recruited to your company, sent to work on a project, and can travel from project to project around the world, and attend summits. from any project to a summit topic about the same energy source as the project. It's also possible that one of your Scientists gets moved as part of another player's Action, because your opponents may install or construct projects on which your scientists are working. or sending the scientist to a summit topic about the same energy source as the project. After sending your scientist away, the active player must immediately utilize the tile. She cannot use any Free Move between sending your scientist away and using the tile. Example: It's Blue's turn. He wants to install a solar project. That project has a Purple scientist. Before installing it (flipping the tile), Blue returns the scientist to Purple, paying him 1 coin. Purple decides to take the scientist into his hand and immediately gain 1 Expertise in solar energy (note: same as the project). Now, Blue must install the project before he makes any of his remaining Free Moves. Scientists are recruited from the recruitment pool using the Propose Project action on a space that grants Research collaboration (see Propose Project). Each player is limited to 4 scientists. Expertise is the knowledge and political value of the Companies in each of the green energy sources in the game. and when you choose to take a scientist back into your hand because another player installs or constructs a project on which one of your scientists is working. Example: It's Orange's turn, he has 1 scientist in a Cold fusion project in Europe. On his turn, he proposes a biomass project in Asia and sends a scientist from his hand to work on the newly proposed project. Because Orange now has scientists working on both projects, at the end of his turn, he may choose to earn 1 Expertise in Biomass or Nuclear cold fusion. Your Expertise in each type of energy is tracked on the board by a player disc. When you earn your first point in Expertise in a energy source place your disc in the first space. Income: At the beginning of the Supply Phase, the players in 1st and 2nd place in each energy source, receive money and /or victory points. License to Build: In order to build a power plant, you must have enough Expertise in that energy source. The construction icon on the Expertise track indicates the minimum Expertise required to build the lower- level plant of this type. Region Control: Expertise are a tie-breaker when determining 'Region Control'. Bonus: When the Expertise disc reaches a specific space, a bonus is given. Example: To build the lower-level forestation plant, your forestation Expertise needs to be at or beyond (as the yellow disc) the 3rd space of the track. Energy symbols: You gain 1 Expertise in the energy source matching the symbol. Resource: You receive 1 tech resource cube. Region CEP: You place a CEP from the ~ market on any region of your choice. Expertise symbol: You gain 1 Expertise in any energy source. Note: It is possible to create combos with these bonuses! Companies can send their Scientists to represent their interests at a World Summit, in order to gain Expertise in the Energy sources that are the topics of that summit. The scientists will share their knowledge - knowledge that they have acquired by researching green energy sources - with the world. They will also learn about other energy sources discussed at the summits. In order to gain Expertise at these summits, interaction with other scientists is crucial in order to establish the types of protocols determined by a World Summit like Kyoto. A "summit topic" is the climatic theme for discussion at a particular summit. It is represented by the energy source symbol depicted on the tile. When every topic at a summit has a scientist giving a talk on it at the end of any player's turn, all participating players gain Expertise, in turn order, ending with the active player. There is only room for 1 scientist to talk per topic. But, at the same Summit, scientists from different players may speak on different topics. 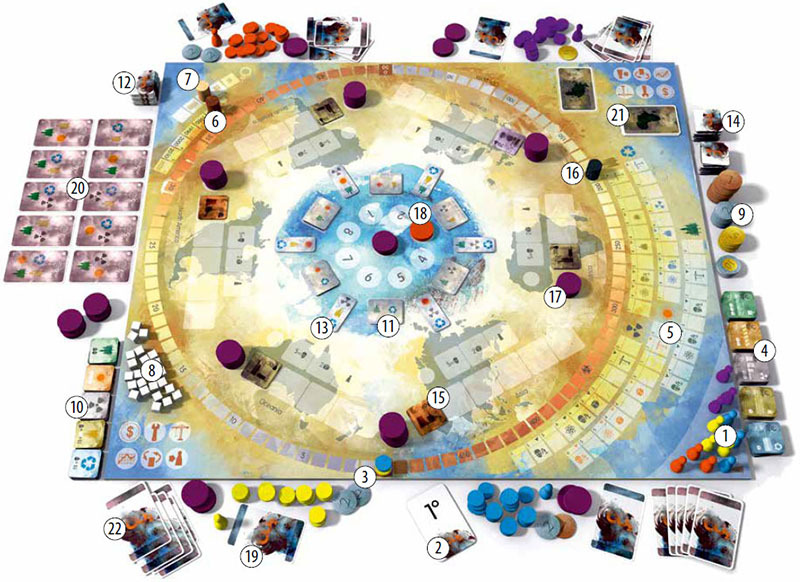 After scoring, the scientists return to players' hands, and a new summit tile replaces the completed one. Note: A scientist can only be moved to a summit from a matching project. Once at the summit, the scientist cannot move away until the summit is completed. Each of your scientists that spoke at the summit earns your company 1 Expertise in the energy source matching the topic that the scientist represented at that summit. Additionally, by attending the summit, your company gains 1 extra Expertise in any topic covered at that summit. Example: A Summit with Forestation, Nuclear Cold Fusion, and Recycling is completed. The Orange player has scientists speaking on 2 topics: Recycling and Nuclear Cold Fusion. The Purple player is speaking on 1 topic: Forestation. The Orange player gains 1 Expertise in Recycling, 1 Expertise in Fusion, and 1 additional Expertise in any one of the 3 summit fields - even the topic on which he wasn't speaking, if he likes. Purple increases his Expertise in Forestation energy by 1, and 1 additional Expertise in any one of the 3 summit topics. The Red CEP over the numbered circle near the center of the board indicates the current price of the CEPs. You can buy 1 CEP, taking it from the market pile to your hand, by paying the bank the price indicated. If the market pile runs out, you will see the word "STOP" to remind you that you can no longer sell during your turn, because the market price is changing. Refill the market with 2 CEPs from the bank, and increase the CEP price by 1 (maximum price: 8); otherwise, the price does not increase. If and only if the market price has not changed yet during your turn, you can sell 1 CEP from your hand (and only from your hand) to the Market. To do this, place a CEP on top of the market pile, and receive money equal to the current price. The CEP price goes down by 1 (minimum price: 1). You may never both sell and buy in the same turn, and you must complete the transaction before anything changes the market price. Every CEP that enters play is taken from the market, with the exception of the ones that refill the market when it's empty. Those come from the bank. Every CEP paid/spent goes to the bank, except when you sell 1 CEP: In this case it is added to the CEP market. During your turn, you may play 1 Lobby card or score 1 UN Goal card. Lobby cards represent influence of political lobbyists. When played, they provide some abilities to you. During your turn, you may play 1 lobby card from your hand. Then, the card is removed from the game. Any lobby card can be used one of two ways: The main lobby at the center, and the minor lobby at the bottom. To get the main lobby benefit, you have to take a specific action, which is specified by an icon at the top of the card: propose, install, construct, send scientist to a summit, or take a market action. The minor lobby has no such condition, and may be taken anytime during your turn. yourself. Extra points are awarded at the end of the game to the player who has the most. Remember: On your turn, you can play a Lobby card, or claim a UN Goal card, but not both! Each region has a Regional Agenda tile. These tiles represent the only 3 clean energy sources the Region will accept. You can take CEPs from regions you control, anytime you need to spend them. At the end of the game, you will receive all CEPs from regions you controls (which you will sell). You are responsible for the CEPs your regions need during the 'Energy Supply step'. Whenever you build a new green power plant, check to determine whether you wrest control from the player who currently controls the region (if any). If no one controlled the region, you take control automatically, and place one of your color discs on the Region Control space near the region. In case both of you provide the same number of different energy sources, control goes to the player with the energy source in the highest position on the Regional Agenda tile, counting from top to bottom, then second position, then third. If you both have identical types of power plant in the region, compare Expertise. Only compare plant types you have built in the region. Keeping that in mind, region control goes to the player with more Expertise in the top energy source the Region requires. In the case of a tie, compare Expertise in the second energy source; and in the case of a further tie, compare Expertise in the third one. If Expertise is identical in all sources of energy that you have built there, you take Region Control from the player currently controlling the region. If you win, replace the current controller's control token beside the region with your own. Note: The only projects / power plants that are allowed to be in a region are those on its Regional Agenda tile. There are 4 kinds of cards in the game. Company Goal cards represent the companies' goals from the start of the game. One is given secretly to each player during the setup. They will be scored at the end of the game or you can discard yours at any time in exchange for 8 coins. These cards remain secret at all times, even if they are discarded. Event cards - These represent regional disasters and the relief effort provided by the players' companies. There are 6 event cards representing the 6 regions in the game. Players not in the region will have to be prepared to send the region aid. Make sure you already have either a power plant in the region, or a tech resource to spare; otherwise you will lose 2 points. The following is a summary of how CEPs move in the game. Please be sure to read it now and refer to it the first few times you play, because the CEP economy is crucial to the game, and getting CEPs to the right places is what makes it work. From the bank when the market is empty and need to be refilled with two CEPs. All CEPs come from the Market. When you play the minor lobby of a Lobby card with a CEP for its minor lobby. As one payment option in the auction variant to determine the first player. A Region pays a CEP to the bank when a fossil fuel power plant gets built to meet energy demands, and no one Controls that Region. When you replace a fossil fuel power plant with a new green power plant. When your Expertise disc reaches the Region CEP bonus space. If the global CO2 pollution level returns to the safe zone, under 350 ppm. If the global CO2 pollution level is at 500 ppm or higher. In this case everybody loses. Don't bother to count the points: You need to find a new planet to inhabit. Add all CEPs from the regions you Control to your respective hands. Sell all CEPs to the market at the current price (do not adjust the market price). Distribute Income to all players. 3 points for the player who has scored the most UN Goal cards. In a tie, all tied players receive the 3 points. The winner is the player with the highest score. In case of a tie, the tied player with the most green power plants wins. In case of a further tie, compare the tied players' Expertise in each energy source, in order (forestation, solar, cold fusion, biomass, recycling) until someone is best. If still tied, whichever tied player control more Regions wins. If somehow it is still a tie, all tied players are winners. 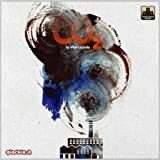 Note: When your score reaches 50 VPs, place a second disc on the number 50 on the Global CO2 Pollution track, and start the other disc back at 0 on the VP track. At 100 VPs, move the second disc to 100, and reset the other to 0 again, and so on.